How to set a beautiful table using your favorite collection of plates. A bird’s eye view of the table shows how vintage plates set the tone of this table, but modern elements like ombre napkins, fresh flowers, and a stylish eyelet tablerunner keep it from looking too old-fashioned. I’m often drawn to flea markets, thrift stores and yard sales. The thrill of the hunt never ceases to excite me! Certain pieces just seem to speak to me, and vintage china always seems to be on my radar while I’m out treasure hunting. Recently, I’ve been drawn towards antique rose china embellished with beautiful patterns and it’s become one of my favorite things to collect. 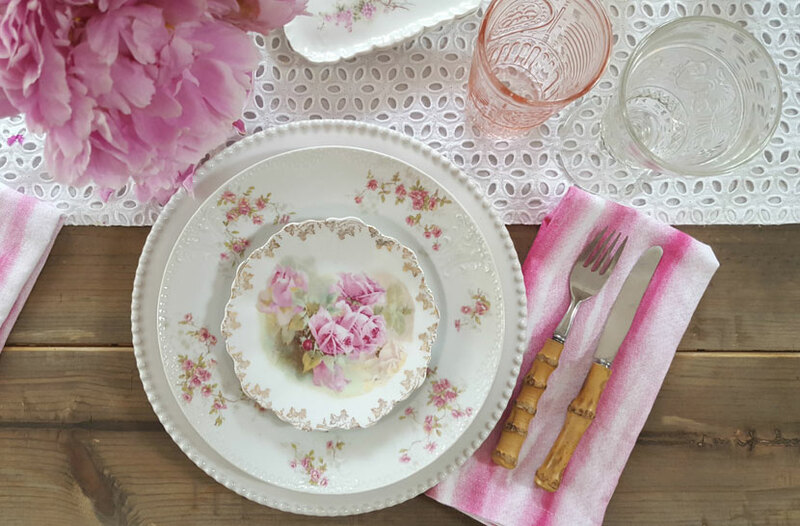 These vintage patterns are feminine and flirty, and best of all, they work beautifully for a romantic table setting. 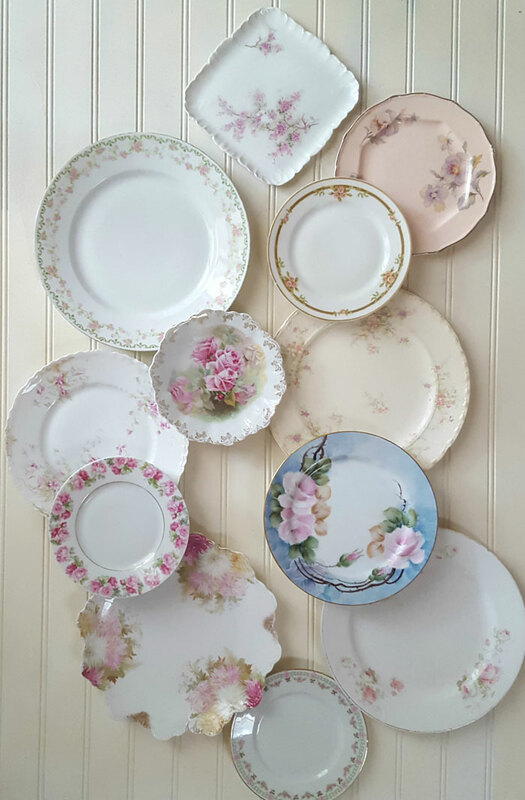 Collecting beautiful patterns of rose embellished china is easier than you may think. 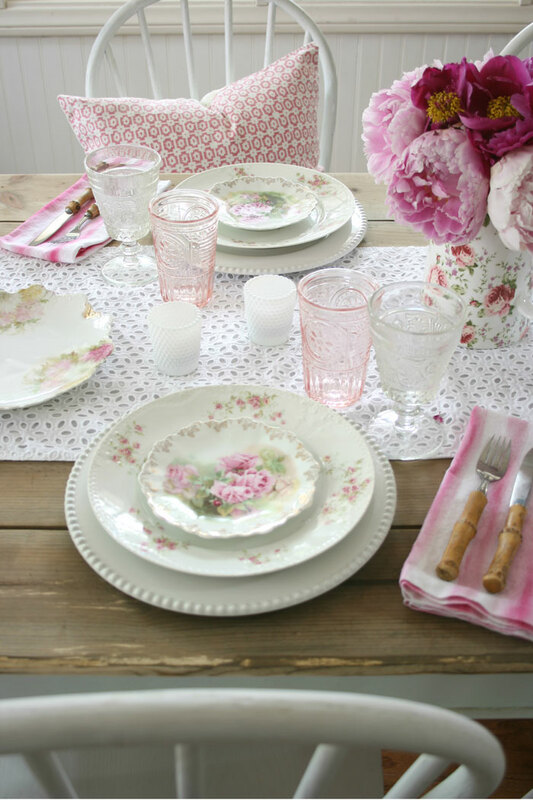 Look for plates in similar pink tones and patterns, and they’ll coordinate perfectly with each other. 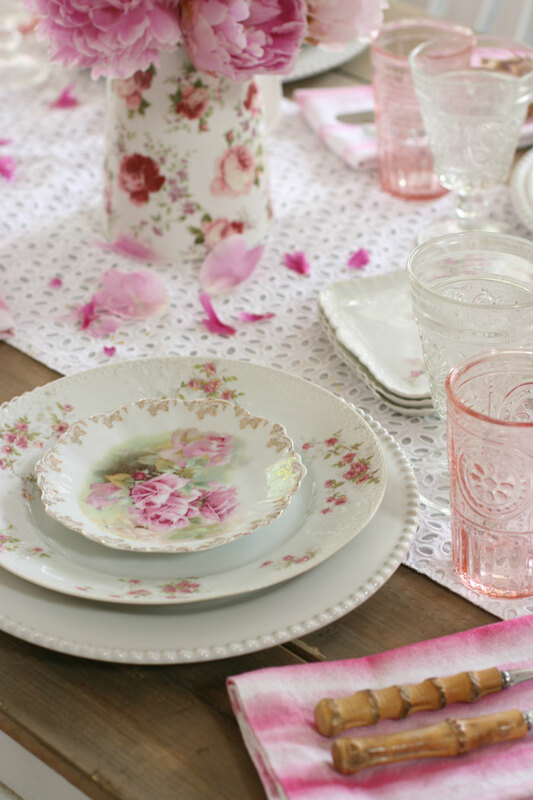 The next time you visit a flea market or thrift store, be on the lookout for pretty pink rose patterned plates. You can often find them in small sets, which is my favorite way to acquire them, but unique individual plates are also quite practical and fit in nicely if they’re in the same pink color palette. My favorite patterns are made in England and made of fine bone china, but I’ve found gorgeous German examples that are quite unique and look like they’re hand-painted. Pink accents add romantic charm to the table, while a white runner provides the perfect backdrop and keep this whole look light and lively. Delicate patterns in the pressed glass and eyelet runner offer subtle texture and contrast to the whole setting. Just like any collection, mixing and matching is made easier when the plates have a common design or color. Dinner plates, salad plates and bread plates all layer beautifully with each other, and especially look lovely in coordinating but mismatched patterns. I’ve found that collecting different size plates also helps when arranging them together at a table setting. Feminine details set against the farmhouse table and chairs creates the perfect romantic table setting. This look is easy to pull together, if you just remember a few of these simple rules for using your favorite collection of vintage china. 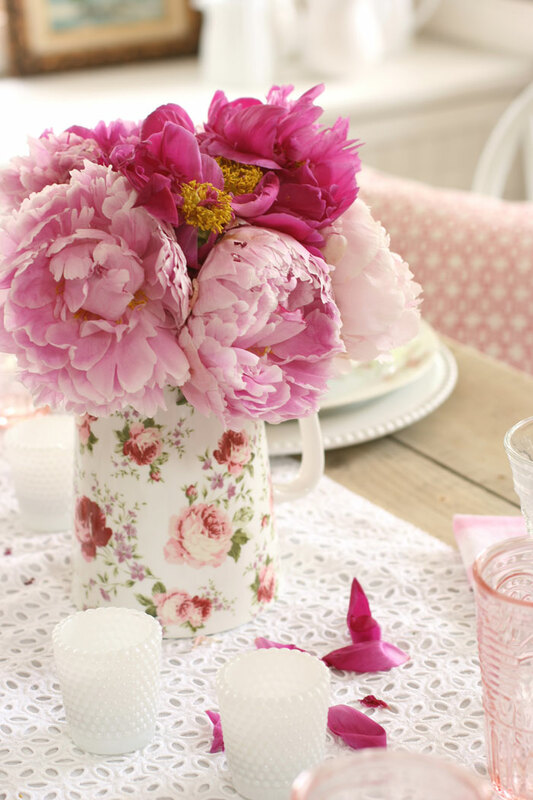 To get more bang for your buck, tie the whole table together with pink accents. 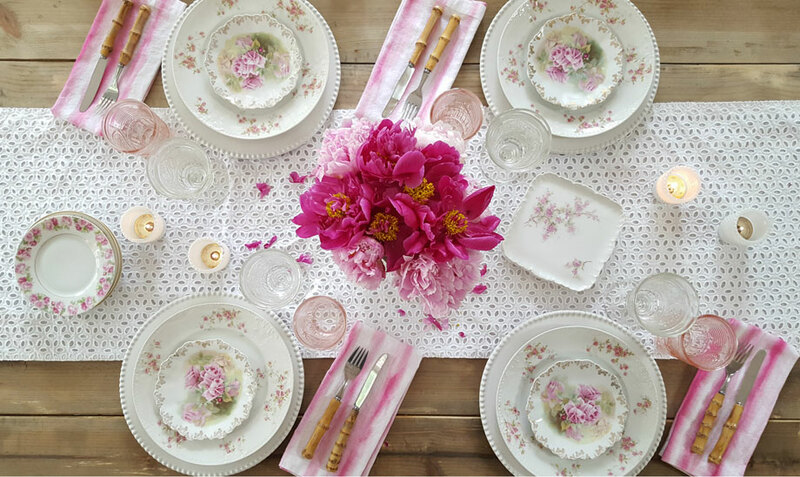 Adding pink glassware, napkins and flowers will naturally accentuate the pink rose pattern on the china, and capture everyone’s attention. Think pink when setting this kind of table! Small and large patterns of roses on each plate complement each other, while the vibrant pink hues in the flowers and napkins punctuate the vibrancy of the pink roses at the center of each place setting. What’s the easiest way to turn an ordinary table into a romantic table? The answer is feminine details. Of course our rosy plates add feminine charm, but go ahead and add one or two more girly elements, just remember not to go too over the top with frills and such. To keep this table from looking stuffy, an eyelet table runner does the trick and adds a little whimsy to this whole look. A few modern elements help keep the table from looking a little too old-fashioned. As romantic as roses are, a pitcher of pink peonies adds modern flair to the table, while the colors of these fresh flowers work perfectly with the roses on the plates. Vintage bamboo flatware offers the perfect contrast against the pink tye-dyed napkins and both these elements add a much needed dose of fun to this tablescape. 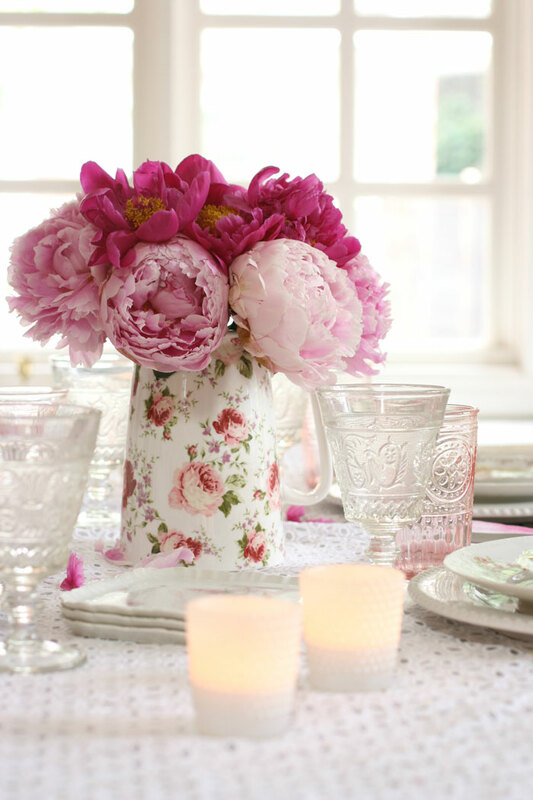 As romantic as roses are, pink peonies add modern flair to the table, and the two tones in these flowers work perfectly with the rest of the table. 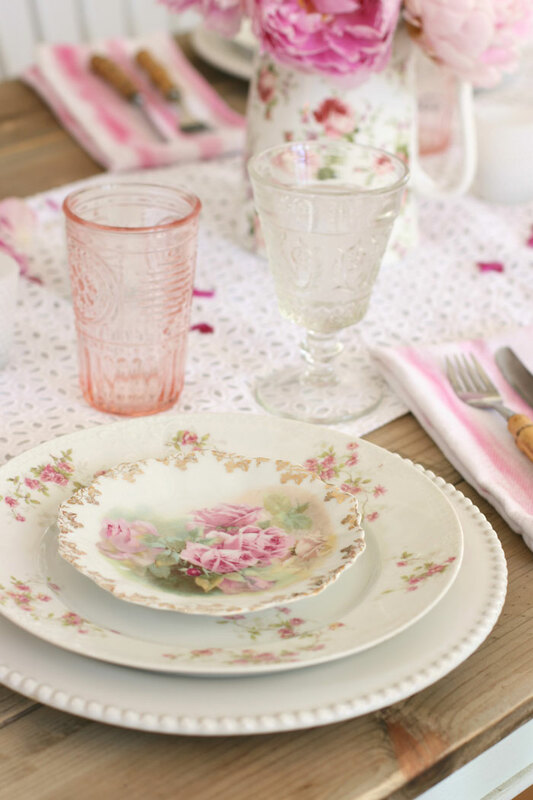 Vintage or new, rose patterned dinnerware is fun to collect, but if your passion is collecting another type of china, you can still keep these tips in mind when setting your table. The same rules apply for other fun collectable plates like transferware or cabbageware. Just remember to mix and match, accessorize with a fun color, add a modern touch and incorporate feminine details. Your table is sure to be a hit with your friends and family! Two different patterns of china are used at each place setting with a simple white ironstone plate visually anchoring the look. And of course, hints of pink are a common thread used throughout this tablescape. Crafting elegant tablescapes is one of Fabiana’s many talents and passions. She regularly shares her inspiring designs on her blog, Ciao! Newport Beach and on instagram.